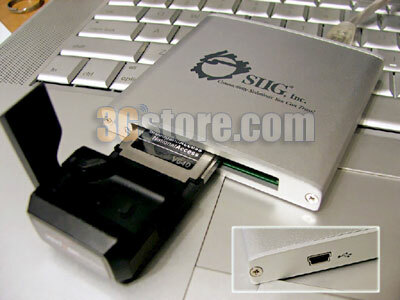 Many of our customers have a notebook like the MacBook Pro that comes with the newer ExpressCard slot. Naturally, they can use either the Sprint EX720 or Verizon V740 Rev-A ExpressCard options, but they would really love to use the device they buy with their desktop computer as well. They end up pondering for what seems like hours... or days... about whether or not they should get the ExpressCard, or the USB Modem which would work with any of their computers. When used with their notebook, the ExpressCard option is going to be much more aesthetically appealing than the USB device ... but they don't always use their notebook and the USB device would work with all their computers. Decision, decisions. Today, 3GStore.com is announcing a new product that gives these customers one more thing to think about -- an ExpressCard-to-USB adapter that will allow them to use their ExpressCards with practically any computer that has a USB port. We will sell and support this adapter for $49.99 which is cheaper than what we sell our PCMCIA to ExpressCard adapter for, and obviously the USB adapter provides more flexibility. Anyone who bought their ExpressCard with service through 3GStore.com is entitled to a $10 discount. Contact us with your name and/or invoice number to request your coupon code.